Marmalade, the pot belly bunny, wishes you a lovely Monday and week! Details about Marmalade’s merry adventures are forthcoming. I can hardly keep the secret, but keep the secret I must… for now! 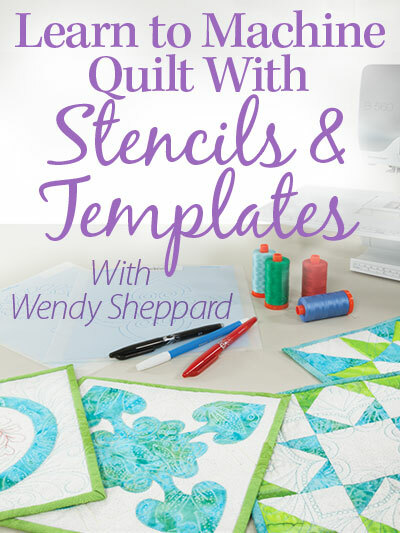 I am curious though — how many of you do hand-embroidery in addition to piecing, applique and quilting? Thank you for stopping by. Have a great week. Hugs to you all. This entry was posted in Needlework and tagged Aurifloss, Hand Embroidery. Bookmark the permalink. I love to had embroidery and have been doing it since I was about 7 years old and now I am OTD- older than dirt. 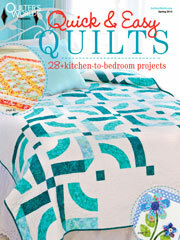 I have made a number of quilts with had embroidered blocks. I think it adds so much. I have recently started doing hand embroidery again after more than 30 years. Am just really enjoying it. I think my Great grandmother that taught me would be very happy, and proud of my neat backs. I also have embroidered since I was very young (many years ago! )…have a set of flour sack towels to embroider to replace my old ones, but would rather be quilting. 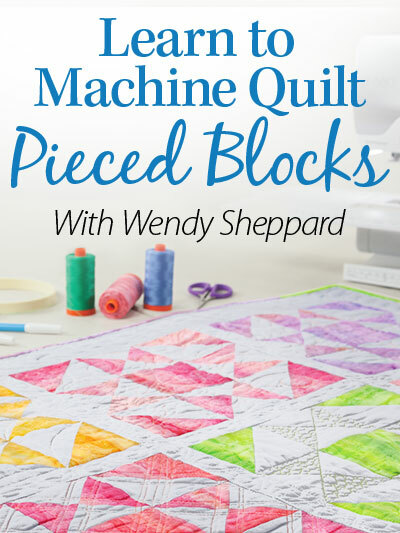 Can’t wait to see what Miss Baby came up with…she may not follow Mom into quilting, but she is definitely already artistic! I have done lots of embroidery in the past few years, crayon coloring, wool applique, and just plain old embroidery! Love it! How cute that Miss Baby is helping!! I learned to hand embroidery from my mom and grandma as a child. 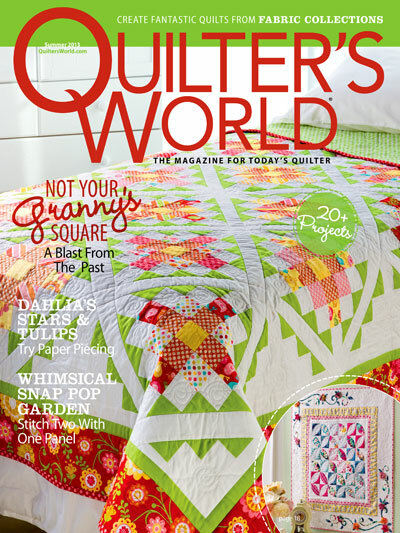 Later, I did crazy quilts and still love to mix hand embroidery with traditional quilts. The very first craft I did was hand embroidery … There were 3 of us that would sit, embroider and just enjoy being friends. Been doing it for 70 years. LOL Love adding it to quilts, etc. Just a bonus. Yep, I love doing all four. My mom taught me to embroider when I was about 6, so have been doing it for 70 years and still enjoying it. Did dishtowels for everyone for Christmas last year. Have a project going for a quilt with colorful embroidered sugar skulls. Finished a wall hanging with embroidered Celtic designs. Love piecing, applique, embroidery. Actual quilting not so much. I almost always have a hand project for evening sewing. It’s usually embroidery. I love to play with the colors and designs. I used to do cross stitch and needlepoint but the night vision isn’t what it used to be. It’s harder for me to change where my eyes have to focus when looking from the chart to the project. I’ve also added beads to some of my quilts. Pot bellied bunny is really cute. When my kids were little, I took some of their pictures and transferred the designs to cloth and embroidered them. Funny think, I ran across one just yesterday and now your post. My kids are in their 40’s now. I just might frame one for each for a present at holiday time. To answer your question, if it has to do with fabric, I do it. Hand embroidery, longarm quilting, piecing, dyeing, applique, all of it. What a fun sneak peek. Maybe Miss Baby needs to create her own designs for sale. I absolutely love what you are able to share and eager to see more. Pot belly bunny is just too cute…… I’m anxious to see more……. I love embroidery, I remember my first attempt when I was about 4-5. I did a cross-stitch piece of Little Miss Muffett…… I continue to love embroidery. I am currently stitching a Redwork series of teapots that will turn into a quilt. I’m on my last of about 10-12 pieces…. fun, fun, fun!! I do a little embroidery, but I prefer cross stitch – I like to design my own pictures. Oh yes, I love embroidery. My last thing was embroidering leaves and vines up the front of a wool vest for my son (he’s in his 30s) and asked if I would do that for him. Of course! He liked it! Hand embroidery is the one thing I’ve done in the way of stitching. Not so much lately – it’s getting hard to see it. It’s such fun to see the joint effort from you two talented gals. Yes, I do enjoy the embroidery. Sweet potbellied bunny. Sure there is a great story to go along with the bunny!! Love the bunny! I love doing embroidery by hand and machine. I always keep a little bag in my purse for those times I get “stuck” waiting somewhere. Is Miss Baby going to write a story to go along with the bunny? I enjoy hand embroidery as well as cross stitch. I don’t do it as much as I used to–need to take a break sometimes and relax with embroidery. I have several projects waiting for me. The bunny story sounds delightful! I JUST tried my first hand applique work yesterday for the first time. I am liking it! 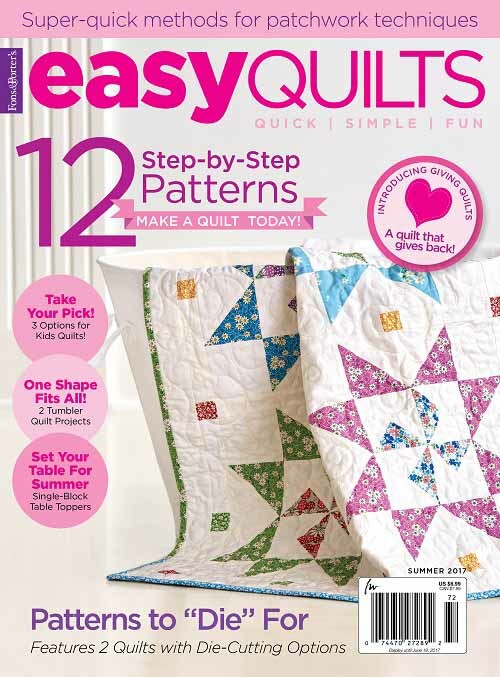 I also just learned EPP in addition to my piecing, applique, and long arm quilting :) I LOVE LOVE LOVE quilting!!!! I started embroidery when I was young. My neighbor taught me how to do cutwork before I was 12. I often add embroidery to my quilts or make a quilt where embroidered scenes are featured. My grandma taught me to do thread work when I was 5 or 6. 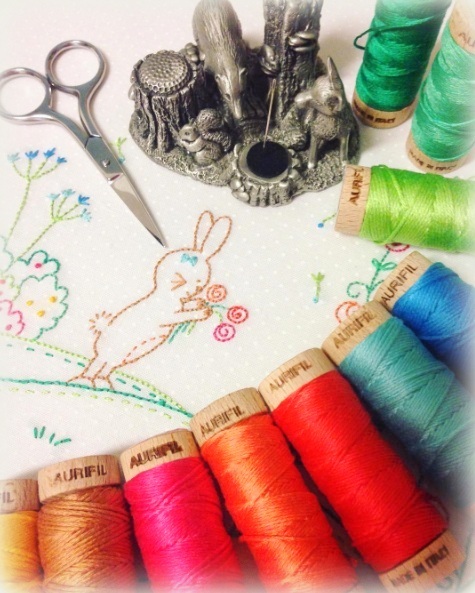 Through all my different sewing fancies, embroidery remains foundational. 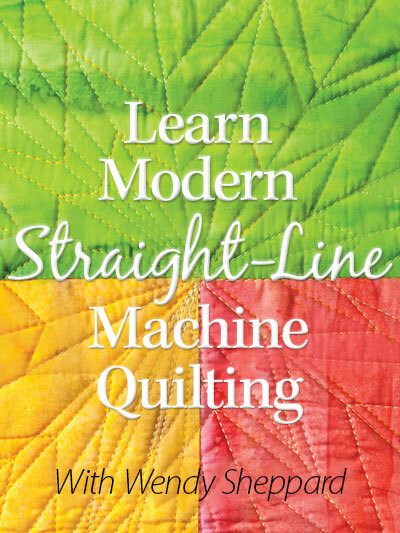 I’m enjoying a crazy quilt course I’m taking. Of course, many of the seams are embellished with hand embroidery. It’s nice to have a hand stitched project on the go to fill in the evenings where I’m not stitching a binding. Like some of the ladies above, I learned embroidery as a child. I picked up “candle-wicking” in the ’80s and spent many happy hours in Indonesia doing that and cute little embroidered bags and such for my kids. I’m thinking I need to finish some pillowcases that my mom left unfinished. Hmmm. One son’s quilt is almost like a “sampler” with practice stitches and embroidered images. It’s been a while…..
My little babushka with only one hand taught me to embroider when I was young. She was very patient with me. Sweet inspiration from Miss Baby. Just bought your Highland Stars pattern from Keepsake Quilting and not sure whether “F” block needs to be trimmed down when joined to A-B, and A-C. Please advise if I should find the middle of these triangles, join and trim to 3-1/2″ square.